MADISON, New Jersey (WABC) -- Over 120 dogs have been given new life after they were recently rescued by Humane Society International from a dog meat farm in South Korea. The dogs have already begun arriving at the St. Hubert's Animal Welfare Center in Madison, New Jersey as part of an emergency shelter operation. They have been receiving medical treatment and time for adjustment before their eventual adoption at a later date. "We are proud to welcome these deserving animals and make sure their stories are told to help effect change," said Heather Cammisa, President and CEO of St. Hubert's. 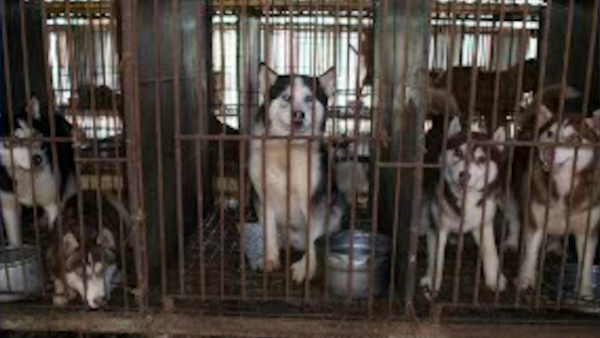 "Two of the Huskies were so happy to see one another again, they were face licking and frolicking in the cage when reunited. It is important for the world to see the individuals impacted." The farmer who released the dogs will now be growing mushrooms instead as a part of HSI's efforts to discourage the existence of dog meat farms. Several dogs will be put up for adoption directly by St. Hubert's, while the rest will be placed across different shelters along the east coast, which includes four in New Jersey and one in New York. The full list of shelters is below.